I made this small table runner a number of years ago. I love the Christmas colors. At some point I'd really like to make a whole quilt with these circles...someday. In the midst of family coming and going, I'm trying to finish off a couple of quilts. Pictures are going to have to wait til after Chritmas. Before my folks arrived yesterday afternoon I was able to get a bit of quilting done but not much because Jonathan was online. We spent a lot of time "chatting" as he waited to begin his trip HOME! We had too much fun! I am so thankful for technology these days! I continue to be amazed that someone on the other side of the world can seem right next door. He's more than ready for his leave! 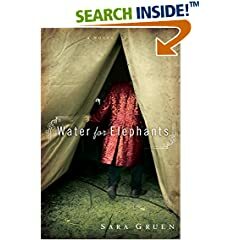 Have any of you read this book, "Water for Elephants?" It has received excellent reviews. It is on my reading list, and I'd love to know what you all thought.